As we all know one of the great paradoxes of the markets is their tendency to rise on speculation but fall on uncertainty. Never mind that speculation is uncertainty! That observation causes me to lie back and think of England. Perhaps I should explain. Americans may think that what may be happening on the other side of the pond(s) may not affect us much…but they would be wrong. Take for example the current haggle over the United Kingdom following through on their plan to leave the European Union. This is a major geo-political event no matter how you look at it. Brexit, as it is called, would have a profound effect on free trade within the European ‘single market’. It would hamper travel conditions for citizens of both entities and create a myriad of other problems. Over the last few days, there have been a number of developments and non-developments. Prime Minister Theresa May managed to collect enough support from her cabinet for them to finalize (more or less) a plan to present to Parliament, which almost immediately said they would not accept it. A couple of ministers resigned and more threatened to. Someone has called for a vote of confidence in order to push PM May off her perch. Many of the ruffled feathers have been smoothed over today but the whole thing is far from settled. Looming large is that all the polls say that if the Brits had a chance for a ‘do-over’ — another referendum on the whole idea — the measure of leaving the EU would fail entirely. Meanwhile, the EU is also facing another issue. The Italians are up in various arms about getting their budget approved by Brussels. If they can’t meet certain guidelines (mostly about debt and inflation) they will be asked to leave the Union — which is the last thing the Union wants or needs. Common to both of the above-mentioned problems is the issue of currencies: the British Pound, the Euro and the US Dollar. So, you may be asking ‘How does this affect Americans?’. Well, one of the most immediate bits of fallout is all about exchange rates: The Euro vs the US Dollar. The value of the Pound (GBP) is highly relative to the value of each of the other two currencies — and therefore vice-versa. Although still a relatively new currency the Euro has become an important benchmark. Many of the world’s currencies are pegged to either the US Dollar or the Euro. So, fluctuations in this pair have ripple effects worldwide. Americans feel proud to have a strong dollar but if that dollar becomes too strong it creates big problems for American companies selling things abroad. If sales are lost, so too are profits. If future profits are in doubt the share prices of those companies fall. How will it work out? Unknown. In another word: Uncertainty. Adding to the Uncertainty minestrone are the open issues of tariffs, the effects of the mid-term election results, the potential arrival of several thousand uninvited guests on our southern border, the Mueller investigation and whatever the Fed may do with interest rates. On the infamous ‘other hand’ is baskets of continuing data showing that while the US economy may be slowing a bit its general performance is still indicating expansion. Add all this up and it is little wonder that while the markets are always a battle of Bulls and Bears, at the moment Mr. Market is exhibiting signs of bi-polar disorder. Market Minute – Where are we NOW? Most of you reading this are aware that although we consider the fundamentals of all investments, our primary indicators are technical. Primary characteristics of technical indicators are that they are considered ‘following’ indicators or ‘momentum’ indicators. Accordingly, we look to see where we are and also the direction that things are going. Seen together, this produces an expectation that they will continue as they are until there may be new evidence that they have changed. So, let’s have a quick look at where we are over the past twelve months. We will look at a chart of the S&P500 index as the US market is currently the only one in which we are invested. In theory it seems simple enough to look at a chart and determine the current direction of a stock or an index. 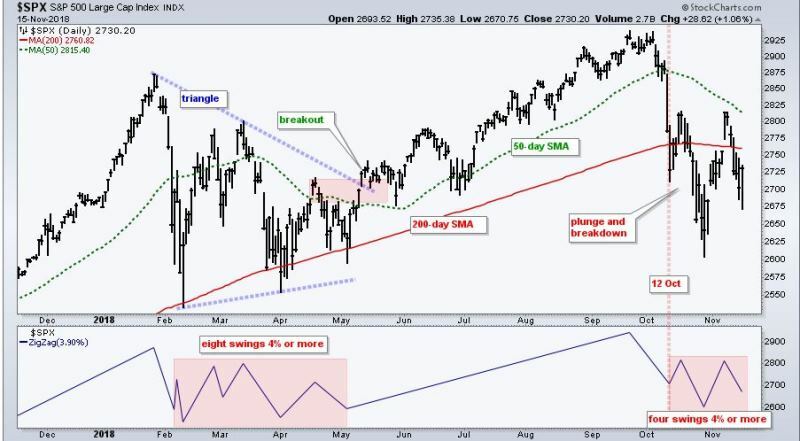 Note in this chart, however, that from February through May the direction of the market (defined by the S&P500* Index) changed direction eight times by four or more percent. This is unusual, to say the least, and makes it difficult for anyone to know with a degree of certainty what the direction actually is. We are now in November and the market has had four changes of direction (again of 4 or more per cent) within the past six weeks! This indicates that volatility is increasing, and we need to consider this environment as we allocate portfolios. More volatility means more risk, more whipsaws, and, quite likely, smaller gains on portfolio moves. So, given that we don’t have the benefit of picking the environment, and can only adapt to it, as more indicators have been showing that markets are moving in either a back-and-forth direction or a down direction, we have adapted by decreasing portfolio risk. We took advantage of a moderately strong ‘up’ day yesterday to further decrease portfolio risk. Nobody knows if we will see further weakness and actually move toward a bear market, or if the market will simply trade in a wide range. It is hard to make money in bear markets and volatile ranges- strong uptrends provide the best environment for making money, and the S&P500 is definitely NOT in a strong uptrend. While markets are non-directional, we reduce risk and prepare for the next directional move. There is a strong historical tendency for November and December to be strong up months – so we are intently watching for an indication that the next directional move will indeed be toward the upside.